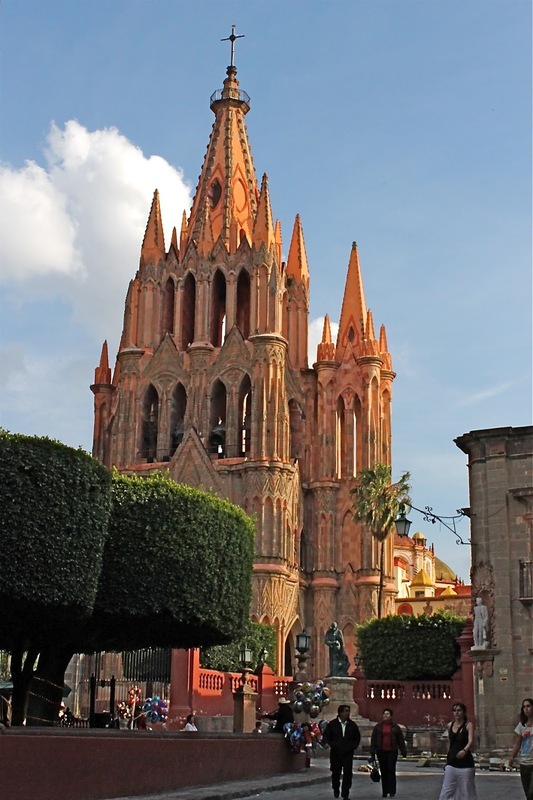 San Miguel: A religious experience of a lifetime! Everyday Tourist (EDT) note: From time to time I have shared with EDT readers emails from my 80+ year young mother about her solo adventures around the world (from New Zealand to Alaska) with tales about her adventures in staying in hostels or travelling by train, to an encounter with a bear. On March 4rd I received the email below from her, which I thought would interest readers. After exploring San Miguel, Mexico on her own for several weeks, she was getting ready wind things down and head home, little did she know she was in for the “Flaneur Experience” of a lifetime. Well, I had two adventures today. I decided to have a pastry from the Blue Door bakery and coffee on the El Jardin (central plaza) where much of San Miguel’s action takes place. As I sat there facing the magnificent La Parroquia de San Miguel Archangel Church, I saw two men with a large crucifix being followed by many locals and didn’t think much of it. As I was finishing my coffee, they started to leave in procession behind two men carrying the five-foot cross. Realizing it was Ash Wednesday, the beginning of Lent, I decided to join them – about 100 Mexicans and me! We went to another church, where they went to the front and knelt quietly for about ten minutes and then said a prayer; I knelt at the back and watched trying to figure out what was happening. We all left and the procession went to three other churches, doing the same at routine. When we came out of fourth church a teenager smiled at me. I asked if she spoke English, but she did not. It has been frustrating not being able to speak Spanish. This is not from San Miguel, but it does illustrate an Ash Wednesday street procession. The procession continued to yet another church, which is almost next door to my Hostel Inn where I was staying. When we came out this time a young boy gave me his purple chrysanthemum (EDT Note: the chrysanthemum is associated with death and the colour purple is associated not only with mourning and suffering, but with royalty and is often used to celebrate Christ’s resurrection and sovereignty), I had noticed they all had one. Then a lady offered me a candy. I was not sure if that was part of the ceremony or not. A young boy, about three years old then took my hand and his mother smiled (they smile a lot here) and we walked together. The next church was the one I usually go to, followed by another six-block procession to the last church. This time we came out, the man carrying the crucifix approached me and I thought he asked me if I wanted to say good-bye to Jesus so I did. I was pretty emotional by then - I felt the tears welling up. Suddenly one lady decided to hug and kiss me and thanked me for joining them. Then all 100 joined in. By now I couldn´t stop the tears - the man with the crucifix said “don´t cry.” But I just couldn´t help it. To have so many strangers, old and young, men and woman all wanting to hug me, all wanted to touch me was a very emotional experience. I have never experienced anything like it before. What a way to start Lent. I walked to the El Jardin and pulled myself together. 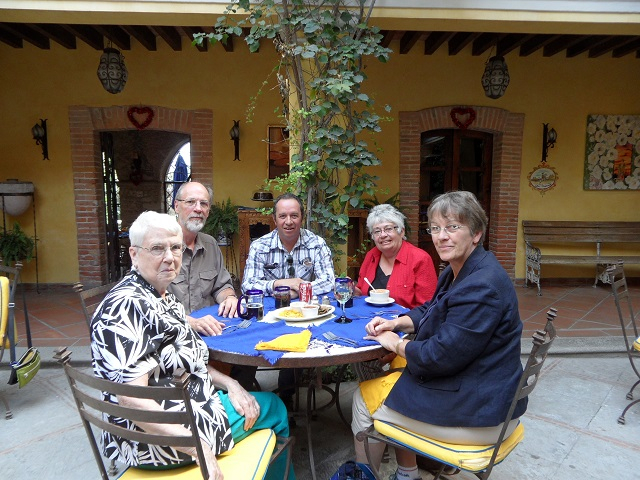 El Jardin in San Miguel Mexico hosts over 100 festivals per year, as well as being the central meeting place for both locals and visitors. I then found my way to where they serve a late lunch every Wednesday to about 100 elderly people. A couple with a B&amp;B/ Spa have sponsored it for 20+ years. They pay people to cook and do the dishes, but volunteers serve. First the people come, shake hands with all the volunteers and saying good afternoon. They are so little and wrinkled with hands so rough they feel like sandpaper- but they are always smiling. They go into a big room for their meal where the tables are marked; with age groups e.g. 80 to 95, 70 to 80. We serve the oldest first after singing three songs. They are served juice, soup and a hot meal. Some bring bags so we can parcel the leftovers for them to take home. One volunteer bought ice cream bars for everyone - they loved that. It was a bit like “Out of the Cold” where I volunteer in Hamilton, Ontario but somehow this is more personal, more caring. I am glad I helped, it was another very touching experience for me – two in one day! I went to the library and read until it was time to go to Mass at 5 p.m., which again was a lovely service and a great way to end an intense day. Being Ash Wednesday, I got the ashes and boy, they don´t skimp on them! Finally, time to head home (yes, the hostel does feel like home after almost three weeks) and I was welcomed back like an old friend by the front desk staff. Marie White in the foreground in black white flower print top, enjoying her tour of Deloros Helego.